Real deal cultural immersion has always been at the core of the 40 Tribes experience. If we really had our way, we’d send a horse cart to the airport to pick you up! The best alternative we see is immediate transport out of Bishkek, deep into the northeast corner of the country. After a quick pit stop/pick-me-up at a locally-run coffee shop in Karakol, you’ll transfer into an ancient Soviet UAZ military bus driven by “Schumacher" and head even further down the road to our partner village, Ichke-Jergez, which sits at the foot of the mountains you’ve come to shred. You’ll catch a glimpse of the zone before sunset and get a taste of the village scene, spending your very first night in Kyrgyzstan in the home of our partner family. Dinner will likely be prepared with mutton raised and slaughtered out back. You’ll share tea and laughs with their 3 adorable daughters. You’ll be exhausted, but so undeniably “in it” and stoked for what’s to come that you just might feel like your trip has already been made. There's no better place for a crucial night's sleep than the cozy back room of our partner family's house. Wake up to the sound of someone stoking the kitchen fire as it echoes throughout the radiant heating pipes. It’s time for a quick breakfast and to help village horsemen load our bags onto the horses. We send them on their way, skin up, and begin our tour right from the front door. The horses always beat us up, but there’s nothing wrong with your bags waiting for you in a warm yurt on your arrival, right? Tea and a yurt-made lunch will be served shortly after, followed by a quick safety/ER briefing, some avalanche discussion, transceiver and rescue drills (on guided tours), and ultimately your first turns in the Celestial Mountains. Your week at the Jalpak Tash Yurts. Wake up daily to a crackling fire and coffee presses ready to pour, courtesy of our main man Kas. Gather for made-from-scratch Western style breakfasts. Shred all day, every damn day!! Hit up the yurt bar at happy hour. Play Yahtzee. Bear witness to some of the most incredible sunsets and sunrises you’ve ever seen over the Issyk-Kul Valley and distant Kungey Ala-Too range. Sit down for epic traditional Kyrgyz dinners prepared by our Chief Chef, “King Nurbek,” over the wood burning stove. 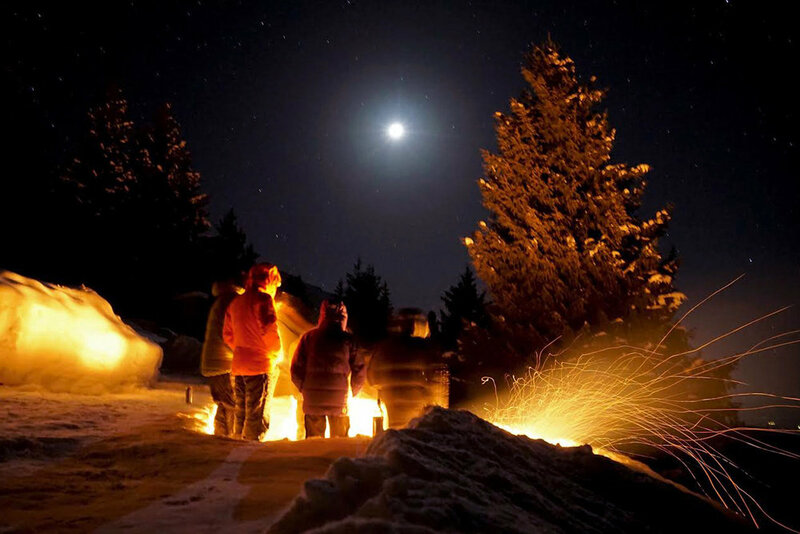 Close it all out with a bonfire on the last night – in the snow, under the stars, with at least one special guest (and his horse) from the village. Pick one last line to drop on the final morning, then it’s a super fun slide all the way out to the village. Schumacher will be waiting in his UAZ for transport back to Karakol, where you’ll stay at our partners’ guesthouse. Showers, dinner, and a night celebrating await. In Kyrgyz, "Sunday" is Bazaar Kün - Market Day. Every Sunday, the largest livestock market in the region takes place in Karakol, with villagers bringing their horses, cows, sheep and goats from hundreds of kilometers away to trade and sell. This is the lifeblood of Kyrgyzstan and is not to be missed. Then, all good things must come to and end! The overland journey back to Bishkek and one final night in the big city await, before flights out the next morning. Or, if you can swing it, plan to stick around a little longer. There is so much more to see and endless – we mean endless – backcountry to explore!